Match your clubs' shafts to your swing speed. Golf shafts progressed from the carved wood sticks used during the development of the game in the 14th and 15th centuries to more precisely made hickory shafts that were used through the 1930s. Stainless-steel shafts have been used since then, and graphite was introduced as a shaft material in the 1970s. Graphite shafts are lighter and stronger than those made of stainless steel. Graphite shafts may allow players to generate more clubhead speed and hit the ball farther while feeling less vibration upon impact than with steel shafts. The USGA specifies that the overall length of a club must be between 18 inches and 48 inches, with the exception of putters, which can be longer. The shaft must be permanently affixed to the clubhead, meaning it cannot be adjusted during play. With the exception of putters, the shaft must be attached to the clubhead so that "the heel portion of the club is within 0.625 inches of the straight part of the shaft," according to the USGA. In other words, no center-shafted clubs are permissible. Flex is a measure of how much the shaft bends. That bend is based on how fast the club is swung and how long the swing takes from takeaway until the ball is struck. A shaft that's too stiff given the player's swing speed results in drives with less than optimal distance. A shaft that's too flexible can lead to erratic shots. Shafts are generally graded X for extra stiff, S for stiff, R for regular men's, A for seniors and L for ladies. Selecting the proper shaft is based on a golfer's height, swing strength and swing mechanics. A player with a fast, strong swing can handle a stiffer shaft, while a player with a slower, weaker swing would be better off with a more flexible shaft. Manufacturers don't have a standard method of measuring flex. What that means is one company's R rating may not be the same as another's. An additional component of flex is the bend profile, also called the kick point – that point on the shaft at which it flexes the most. Where the kick point is affects whether the ball has a low trajectory or a higher one. The same shaft can have a different feel when paired with different clubheads. The shape, weight of the clubhead and length of the hosel all can affect the shaft's flex. The result is that different clubs – irons and woods – require different shafts. Because the shafts of woods are longer than those of irons, a wood's shaft should be stiffer. A longer club shaft generally allows a player to hit a longer drive. Keep in mind, longer does not necessarily mean more accurate. Another property of a golf shaft is torque, the property of resistance to turning or twisting. The shaft twists when the clubhead hits the ball. How much it twists determines whether the ball flies straight, to the left, or right. Where the clubface hits the ball also impacts the torque of the shaft. 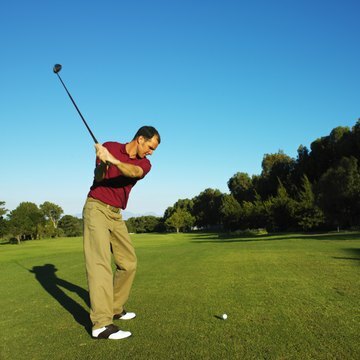 Most players overestimate their swing speed and underestimate the length of time the swing takes – their tempo. A computerized tool called a launch monitor analyzes different factors of a golfer's swing. Based on this information, a set of clubs can be custom fit to enhance a player's abilities. The correct shafts for a golfer's swing characteristics typically are determined as part of the custom fitting.